In 1881, a large bell was forged to commemorate the school. 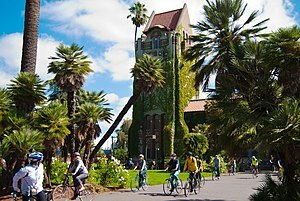 The bell was inscribed with the words "California State Normal School, A.D. 1881," and would sound on special occasions until 1946 when the college obtained new chimes. The original bell appears on the SJSU campus to this day, and is still associated with various student traditions and rituals. The $177 million Dr. Martin Luther King Jr. Library, which opened its doors on August 1, 2003, won the Library Journal's 2004 Library of the Year award, the publication's highest honor. The King Library represents the first collaboration of its kind between a university and a major U.S. city. The library is eight stories high, has 475,000 square feet (44,100 m2) of floor space, and houses approximately 1.3 million volumes. San Jose's first public library occupied the same site from 1901 to 1936, and SJSU's Wahlquist Library occupied the site from 1961 to 2000. In August 2015, a $55 million renovation of the Spartan Complex was completed. The Spartan Complex houses open recreation spaces, gymnasia, an indoor aquatics center, the kinesiology department, weight rooms, locker rooms, dance and judo studios, and other classroom space. The primary project objectives were to upgrade the structures to make them compliant with current building codes, correct ADA deficiencies, correct fire safety deficiencies, expand and modify existing structures, and hazmat abatement. Washburn Hall – After Hoover Hall and Royce Hall were demolished in 2016,   Washburn Hall became the only remaining red brick residence hall on the SJSU campus. Also known as a "Classic," Washburn Hall is reserved for first-year freshmen students only. Washburn offers a smaller living-learning environment for up to 250 residents. In 2009, the city of San Jose was named the nation's top mid-size metro college destination, according to the American Institute for Economic Research College Destinations Index for 2009-2010. The index analyzes the academic environment, quality of life, and professional opportunity in more than 360 cities across the U.S. In spring 2007, an SJSU engineering professor and his students made headlines with their development of the ZEM (Zero EMissions) Car, a Human Hybrid Powered Vehicle (HHPV). The vehicle won the National I2P (Idea-to-Product) Competition for EPICS and Social Entrepreneurship at Princeton University. The ZEM car is the first of its kind to be powered by human, solar, and electric energy. Fraternities and sororities have existed at SJSU since 1896. SJSU is home to 43 social fraternity and sorority chapters managed by Student Involvement. The 43 Greek organizations include social (NIC & NPC) and cultural (NPHC & USFC) . Eighteen of them maintain chapter homes in the residential community east of campus along South 10th and 11th streets, north of campus along San Fernando Street, or south of campus along San Salvador Street, South 8th Street, and East Reed Street, in downtown San Jose. The only SJSU Greek organization not a part of the Interfraternity and Panhellenic Councils that maintains a chapter house is Alpha Phi Alpha. Alpha Sigma Phi and Pi Kappa Phi of the Interfraternity Council do not yet have chapter homes. An additional twenty-six fraternities are co-ed and are either major-related, honors-related, or community service related. Approximately 6% of male students join social fraternities, and 6% of female students join social sororities. Update News is a weekly, student-produced television newscast that airs every weekend on KICU, Channel 36 in San Jose. The newscast is produced by San Jose State broadcast journalism students, and has aired in the Bay Area since 1982. The newscast previously aired on educational station KTEH. Update News also features a daily live webcast. After an 11-2 finish in 2012, SJSU's football team achieved its first-ever BCS ranking and first national ranking since 1990. SJSU was ranked #21 in both the 2012 post-season Associated Press Poll and the USA Today Coaches' Poll. Each year during the fall semester SJSU hosts a series of events where students can watch films at the Campus MovieFest Finale and show school pride at the Fire on the Fountain leading up to the homecoming football game at the newly-named CEFCU stadium  (formerly known as Spartan Stadium). Peter Ueberroth — Major League Baseball Commissioner; U.S. Olympic Committee chair; Time magazine " Man of the Year." ^ " "Archived copy" (PDF). Archived from the original (PDF) on April 5, 2013. Retrieved April 3, 2013. CS1 maint: Archived copy as title ( link)"